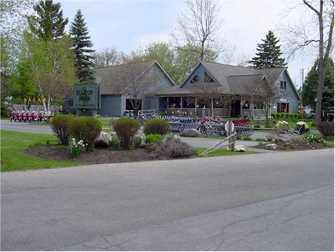 Biking and Mopeding Door County is made simple by Edge of Park Bike & Moped Rentals – near the entrance to Peninsula State Park in Fish Creek. We spoke with Rachel Stollenwerk, who along with her husband Dan, took over ownership of Edge of Park in 2015. Edge of Park opened its doors in 1968! Rachel had been an employee in the shop prior to taking it over. We are excited to be taking over a business with so much opportunity. We look forward to bringing the same passion Craig and Lauren have brought to their customers and introducing new adventures to suit the many visitors Door County sees every year." Open April through October, let’s see what they offer! 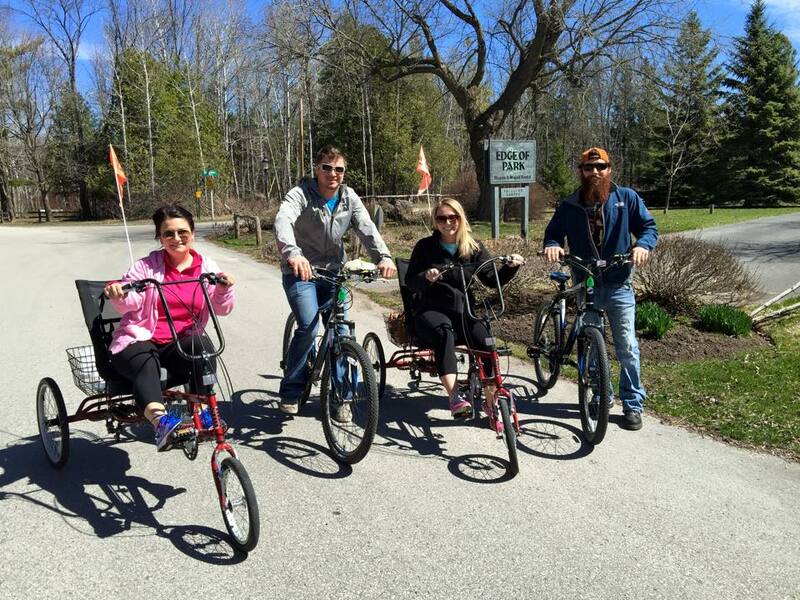 Edge of Park Bike & Moped Rentals offers a variety of bicycle types and mopeds as well – so you can see Door County from a different vantage point! You can rent bikes by the hour, and they have a daily rate of you go over 4 hours. And they will prorate your time too after the first hour by the quarter hour – so if you get back in an hour and 15 minutes, you pay for an hour and 15 minutes (not two hours). Cool. They track your time and figure it all out for you. When you rent the bikes, you will get the safety equipment too like a helmet, lock, gloves and a backpack – all safe and convenient for you. 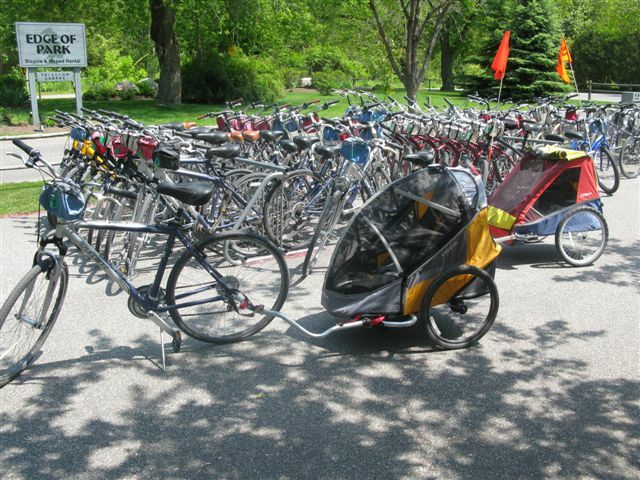 And you can leave your car in their parking lot and enter Peninsula State Park (if that’s where you are heading – and you should – it’s beautiful) on the bike – no need to get a park sticker for your car then. If you want to rent the bikes for a longer period of time – like multiple days – they have rates for that as well. In addition to our hourly and daily rates, we offer multi-day rates that are flexible to your vacation schedule. For the bikes, you have some choices. Simple and comfortable with 7 speeds. That should be enough for most folks. The cruisers go for about $7 an hour, or, $28 for the day. Hybrid Performance Bike: most popular. Great for road and trail, and multi-surface terrain. Performance Mountain and Road Bikes. For the more adventurous who want to wander throughout the county’s off roads and trails. A three wheeled recumbent trike is a unique way to ride and see the scenery. Steady and comfy. Minimum age requirement for this trike is 18 years. About $15 an hour or $60 a day. Tagalongs and burleys can be mounted to any of our hybrid bikes or to your own! You can rent the attachments using your own bikes for about $4 an hour, $16 for the day. Or if you rent attachments along with renting a bike from them, then bike and attachment total is $12 an hour pr $48 for the day. Edge of Park Bike & Moped Rentals has some beautiful mopeds you can rent as well, providing you meet their requirements and guidelines. This is another great option to see Door County from another unique viewpoint. You get the whole works, again, when you rent one – for safety and comfort: You will start of with a full tank of gas and a park sticker. You can rent them for one hour (about $59), two hours ($89) or half day ($149). And you should get there 25-30 minutes ahead of when you want to begin riding to complete rental agreements, do a test ride, participate in their training class, etc. For bikes and mopeds, they can provide you with back country maps. They have some recommended trails as well that they can tell you about so that you can get the most out of your adventure. They have a lot of bikes, so in general, you don’t have to reserve one. But we always like to know we’re going to get one, so . . . Mopeds you should reserve ahead of time. If you are traveling with a group, ask about their group rates as well. Rachel and Dan are bringing new passion to Edge of Park Bike & Moped Rentals while maintaining the decades-long traditions of service and quality. They sell a portion of their fleet each year too – at great discounts. Ask if interested.